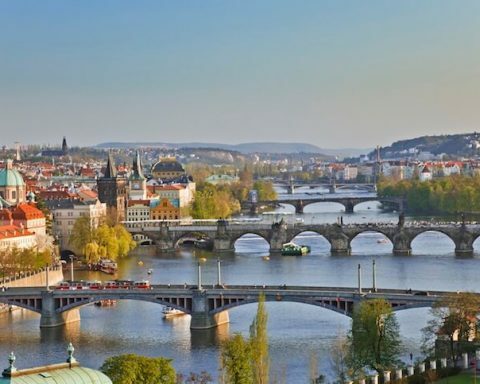 Prague is a city on the Vltava River, surrounded by hills, full of winding streets and beautiful historic buildings. 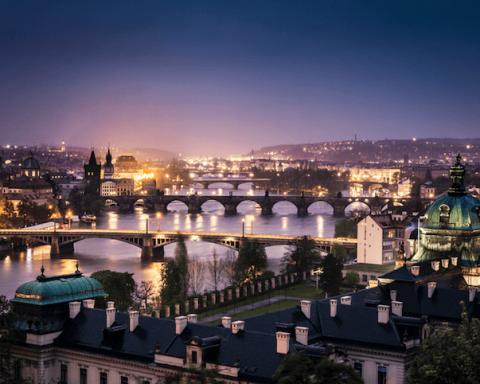 Since its birth over 1,000 years ago, Prague has been the scene of significant events during different epochs, drawing in all manner of people, some of them quite famous. 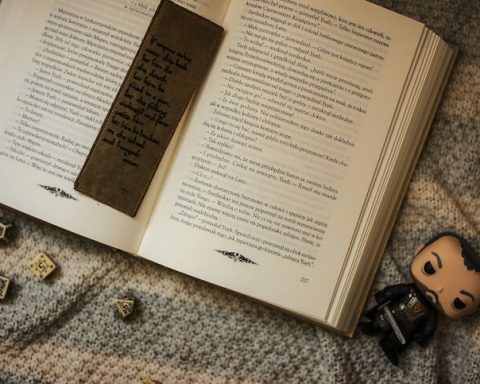 There are several explanations why Prague, also known as the “Golden City” is a magnet for celebrities and notable people you never knew were connected to the place. 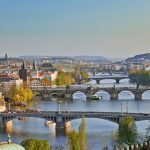 And not only them––around 20 million tourists a year travel to Prague because of the lure of its Romanesque rotundas, gothic cathedrals, baroque and renaissance palaces––the capital city of the Czech Republic is a melting pot of historical buildings in a diffuse range of architectural styles. UNESCO even declared the historic center of Prague a World Heritage Site in 1992. 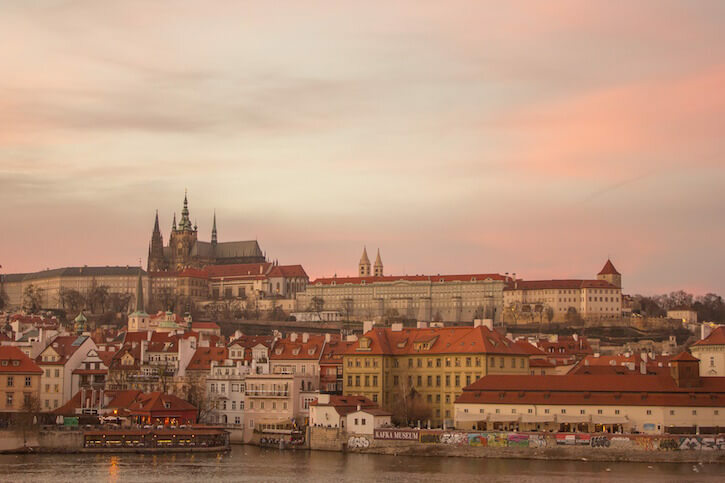 The area includes the Hradcany Mountain with Prague Castle, the district known as Malá Strana, the old town including Charles Bridge and Joseph’s City and the new town. And in 2000, Prague was the European Capital of Culture. So, it is no wonder celebrities, and well-known people could not resist the magnetic lure of Prague? Mozart visited the city of Prague about five times during his lifetime. After Vienna, it was probably his favorite place in the world, a city where he would accomplish great things before he was found dead on December 5, 1791, in his home. Around Christmas 1786––Prague was in the middle of the Figaro frenzy––Mozart received an invitation to the city from the Duschek family. Mozart then promptly traveled to Prague with his wife Constanze on January 8, 1787. 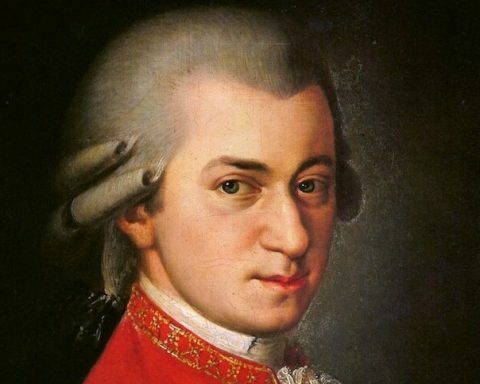 During Mozart’s visit, he created the “6 German Dances for Orchestra KV 509”. 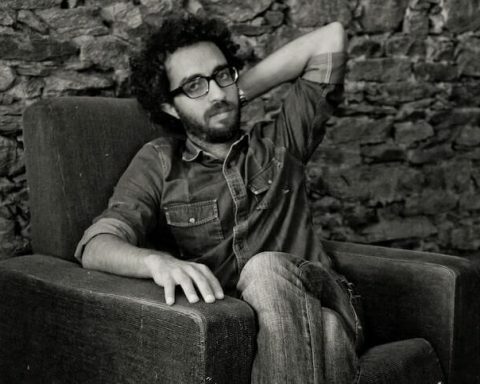 Furthermore, he held a concert in Prague and on January 20 he conducted the “Figaro” himself. At the beginning of February 1787, he returned to Vienna. However, he had already set his mind on creating an opera (Don Giovanni) in Prague. Mozart developed many close friendships during his first stays in the city, enticing the world-famous composer back to Prague again and again. He spent a lot of time at the Villa Bertramka belonging to the Dušek (Duschek) family––most importantly it was where Josefina Dušková lived. Josefina Dušková was an outstanding singer for whom Mozart composed the aria “Bella mia fiamma, addio”. The highlight was his last stay in 1791 for the occasion of the coronation of Holy Roman Emperor Leopold II. Mozart completed the coronation opera “La Clemenza di Tito” in Villa Bertramka, which he performed himself on September 6, 1791, after having previously performed in the coronation in St. Vitus Cathedral with the Coronation Mass No. 14 or the Piccolomini Mass. In a comparably inconspicuous city like Prague, one does not necessarily expect to encounter stars all the time! The prominent European celebrity hotspots in Europe are generally more likely to be found in London, Paris, and Berlin. But that is probably the reason why so many famous guests choose the Czech pearl as a preferred port of call. In Prague they can wander the streets undisturbed––and it has almost always been that way. Since the 12th century, the Old Town Square has been the pulsating epicenter of Prague’s city center. Particularly impressive are the Tyn Church, the Old Town Hall, and the cute, colorful houses, the styles oscillating between Gothic, Renaissance, and Rococo. Even today, memorial plaques tell us that Albert Einstein, Bedřich Smetana, and Franz Kafka once lived in these houses. The author Kafka, anyway, had so many working and living places in Prague, allegedly amounting to over a dozen. One of his former houses is located in the famous Goldmayer Alley, one of the main attractions of the Czech capital. Not John Lennon himself, but his widow Yoko Ono visited Prague in 2003 to pay homage to the famous Beatles singer. On Velkopřevorské Square, very close to the west end of Charles Bridge, fans started to paint today’s “John Lennon Wall” to express their sympathy with rhymes shortly after his death. Over the decades, this has become an ever more extensive and more colorful work of art on which Ono immortalized herself during her visit. However, Paris Hilton’s visit was no walk in the park––it did not go off lightly, to say the least. The paparazzi pursued her and her then-boyfriend Benji Madden of the band “Good Charlotte” during a walk through the old town. Hilton ended up taking a tumble and hurting her chin in an attempt to escape the pursuing local shutterbugs. “I will never come to Prague again, the people here are crazy!” she said after the ordeal. If you have not yet seen enough stars, then you might get lucky at the Jazz Club “Reduta.” It was here where former US President Bill Clinton was a guest in the mid-nineties and spontaneously picked up the saxophone himself to perform a few songs. The best way to end the night is at the cool nightclub “Duplex,” a glass cube built on the roof of a corner building. This is where international DJs perform––and Mick Jagger celebrated his 60th birthday in 2003. It was in Prague where the superstar announced that he would keep on rocking well into his seventies. Moreover, Mick Jagger became friends with former Czech president Vaclav Havel after the Velvet revolution heralding the end of Communism in the 1990s. This friendship resulted in Jagger and the Stones performing numerous concerts in the city. In 1995, the Rolling Stones appeared before a Czech audience of 120,000 people at Strahov Stadium and were the president’s guests at Prague Castle. Another notable person with connections to Prague is former U.S. Ambassador to the United Nations and U.S. Secretary of State Madeleine Albright. Originally called Marie Korbelová, she was born in the Smichov district of Prague in 1937. Her connections to the city run so deep that President Vaclav Havel once claimed during an interview with the BBC that she would be the ideal candidate to succeed him as President of the Czech Republic. She is so closely linked to Prague because her father, Josef Korbel, as a diplomat, was closely associated with Czechoslovakia’s founders Tomáš Masaryk and Edvard Beneš. Albright and her family eventually immigrated to the USA when the Communists took power after the Second World War. She became a US citizen in 1957. The Smichov district of Prague is undoubtedly a preferred haunt for notable people. During the twilight years of the Austro-Hungarian Empire, shortly before the onset of the First World War, Albert Einstein and his family moved to Prague so that he could take up his position at Prague University as the new professor in theoretical physics. 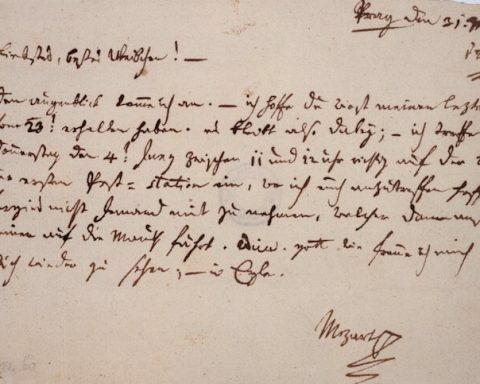 Emperor Franz Joseph signed Einstein’s letter of acceptance personally. And for sure the coffee houses of Prague will remain lively meeting places for writers, intellectuals and other celebrities like they were at the beginning of the 20th century. Notable visitors will continue to walk in the footsteps of the famous writers such as Franz Kafka, Jaroslav Hašek or Egon Erwin Kisch, all of whom were born in Prague in the 1880s, and continue to make this city a cultural melting pot that is irresistible to the famous. Those are interesting facts that contribute to the rich history of Prague. Heard about Mick Jagger concert there before but didn’t thought it was that successful.